1 Preheat the oven to 200C/Gas 6. Mix the sugar, cinnamon, lemon zest and cornflour in a large bowl. 2 Peel, quarter and core the apples, then cut them into rough 1.5cm chunks and add them to the spiced sugar. 3 Add the blackberries and toss everything well together. Tip the apple and blackberry filling into a 1.5 litre pie dish or divide it between individual ramekins. Make sure you scrape all the sugary juices on top of the fruit too. 4 Put the butter, flour and cornflakes in a bowl and rub together between your fingertips until the mixture resembles coarse breadcrumbs. This should only take 2–3 minutes. 5 Scatter the cornflake mixture evenly over the filling. 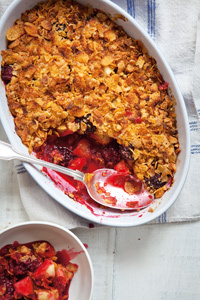 Bake in the centre of the oven for 30 minutes or until the crumble filling is bubbling, the fruit is tender and the topping is golden brown. Serve with low-fat custard or half-fat crème fraîche if you like, but don’t forget that these add extra calories so watch it!